Bank of Baroda PO Result 2018: Bank of Baroda has announced the 600 Probationary Officer Vacancies notification for the Manipal University PGDBF. Huge number of applicants had participated in the PO Exam on the 28th July 2018. Participated applicants currently are searching the Bank of Baroda PO Result 2018. Applicants who will qualified in the PO Exam, will call for the Interview rounds. The applicants are informed that the BOB Probationary Officer Exam Result has been announced on the official website. You can check the Exam result of PO when it has been announced by the BOB Manipal PGDBF. Latest Update (29-09-2018): The Bank of Baroda PO Final Result 2018 (Online Exam) has been announced recently. Candidates can check their Roll number from here. Check the Bank of Baroda PO Final Result from here. Applicant who has been applied for Bank of Baroda PO Recruitment Exam has been selected on the basis of written exam and interview. Therefore the applicants who have qualified in the BOB PO Exam can get admission into One-year full-time Post Graduate Diploma Course in Banking and Finance (PGDBF) from Manipal University. The result has been declared. Follow the below mention steps and you can get your result in easy way. Log onto the official website of Bank of Baroda. Search link to Check the Results for Online Exam of PO PGDBF Program 2017-18. A login page appears on your screen. Fill up the required details of Registration Number/Roll Number and Password/DOB in the empty boxes. A PDF file which includes Roll Number and Full Name of selected candidates gets open within a minute. Download the Merit List PDF file to your device. Keep one copy of it as result copy is required during the interview process. 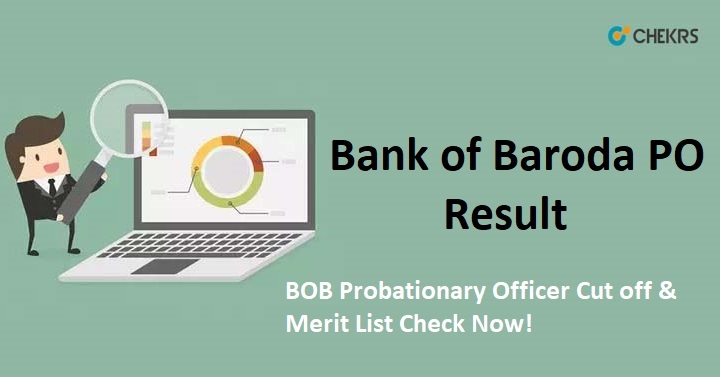 Remarks: Now to get details of Bank of Baroda PO Result 2018 Details keep visiting our site www.jobs.chekrs.com. In case of any query or review your valuable comments are most welcome in the commenting section below and our team will get in touch with you shortly.